Ever got w eary of reading business cases, statements of requirements, risk analyses…? You should try applying a tag cloud to highlight the most important things in them. 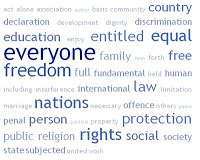 Take a look at the tag cloud of The Universal Declaration of Human Rights. The most important word really sticks out, does it not? Just try this on your project documents. Senior project and program manager, PRINCE2, IPMA-B and PMP certified, with international experience in several countries and across different cultures.